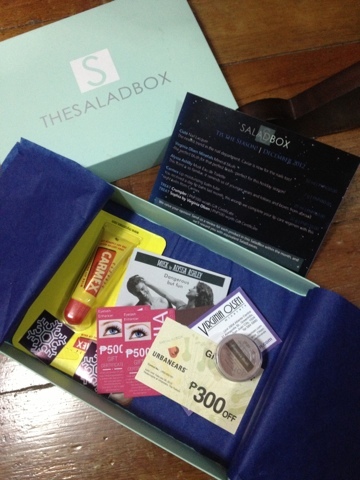 December 2012 SaladBox | Vanity and Everything in Between. I'll be straight to the point with this beauty subscription box. This beauty is the worst box I have received so far. For PhP500, you'll definitely make the company PhP500 richer, your wallet PhP500 poorer, and priceless disappointment from this box. Of course, subscription boxes have kickbacks on the boxes they sell. If they sell a box for Php500, the company gets the product for less than its suggested retail price in the market. Or else, they would just be having a business that does not benefit them. I mean come on, as the owner, nag-business ka primarily para kumita sa business mo at hindi para malugi lang. The idea in theory was beautiful. After all, SaladBox is the first beauty subscription service in the Philippines. They were the niche here. And I was hoping they'd do a great job. But boy, oh, boy. 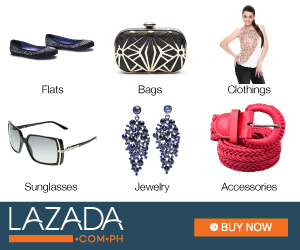 For PhP500, would you buy the products below? Seriously? I thought so. The December box contains a full size Carmex lip balm (which they have also included in their November box), trial size mineral blush from Virginia Olsen, a mini nail polish from Ciate (which can not be seen on the photo because my box did not have one), sample size Alyssa Ashley perfume, Sophia Eyelash Enhancer GC (which is actually a voucher - don't be fooled by the words gift certificate), PhP300 GC for Urbanears, and several flyers. Seriously, for PhP500, those are the items you get. Originally, the idea of a beauty box is for you to try the items without having to buy the full size or something like that and not filling it with GCs/vouchers. SaladBox should have just said, "our box contains several GCs which actually work as a voucher.."
For the Sophia eyelash enhancer, why would you use the GCs included when they're only valid for one month (January 2013)? It retails for PhP2,750 and you can get it for PhP2,250 by using the GC. If you use both and buy two, your total is PhP4,500. But lo and behold, the product went on sale for buy 1 take 1 for PhP3,000 this January and now it's on sale for PhP999!!!! So that GC is practically useless. You also can not use both to purchase one eyelash enhancer. GC is good as cash and does not have any limitations. 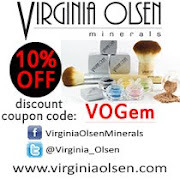 Once it has a limitation, it is called a voucher. Not gift certificate. For the Urbanears, you still need to make a purchase to be able to use the GC. And 300 is not a substantial amount for a discount. I have seen Urbanears and I was not impressed with their earphones/headphones. I prefer Marshall, thank you very much. And if ever I will be buying earphones/headphones, it won't be from Urbanears. The fact that you need to make a purchase to be able to use the items included in the box is really irking. Halatang nang-taga lang and beauty box na ito. I know it's the purpose but have at least the decency to not make it that obvious. So there. That's how good the items that SaladBox includes in their box. Very enticing, right? To those that still believe in this box, good luck. That's all I say. SaladBox has disappointed me from the first box that I received from them. Their customer service is not very accomodating, too. Their turn around time is too long. Sometimes, they do not even bother replying to queries at all. They are selective when it comes to replying to queries. Quite frankly, the answer "not replying to your query was unintentional.." is not ever acceptable. Haller, naka-reply sila sa ibang queries ng mga tao after my inquiry pero my inquiry was ignored. It's just impossible not to see it. Haaay.. Grabe naman! Buti pala di ko natry mag subscribe sa Salad Box.. Thanks for sharing Ms. Gem. @Michelle: oo, good thing you didn't try SaladBox! Sayang ang 500!